With us, you have the toolset you need to combat bad reviews. How does review removal software work? Review removal requests are then created based on the unique content on a case by case basis. Not all bad reviews will qualify for removal. We include include written communication with review websites as well as their responses in a real time environment. Disclaimer: We have no special relationship with Yelp, Google or Facebook and using our third party service may not improve your chances of successful review removal. Reviews are only removed by the administrators of each corresponding website, we have no way to remove them ourselves. Our server will notify you when we hear back from review websites with their decision. Get notifications when new reviews come in via email, SMS, Facebook Messenger or Slack. 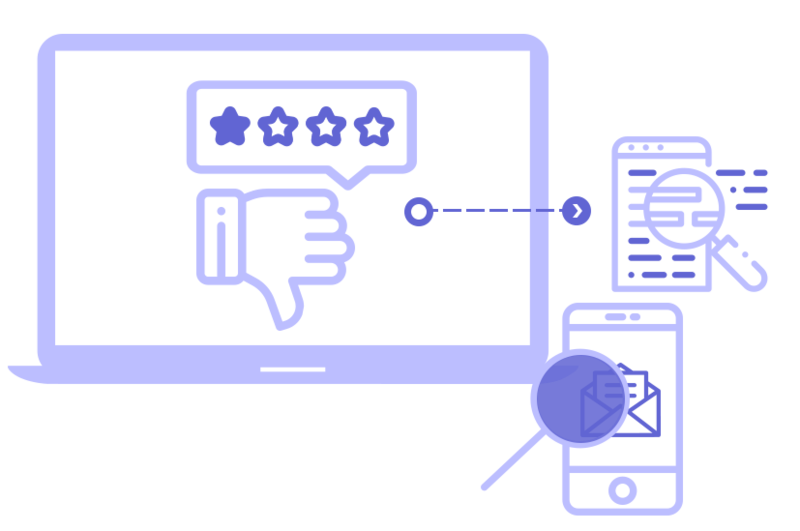 Our server has been programmed to evaluate reviews to provide the best review removal strategy available. Not all reviews will qualify for removal. We will help you and your team collaborate to respond appropriately. We had a really troubling issue with unfair reviews being written for the wrong company. It got so bad that our star rating was impacted and we were loosing money. Their software was able to identify what parts of the review we needed to bring to the administrators attention so they would remove the review. So far we have had 100% success in getting these bad reviews removed.